What are Divisions and how are they different? Updated Wednesday May 4, 2016 by Erich Weiler. We want to reiterate that no experience or prior knowledge with baseball is required to play Little League Baseball! For those who haven't played before and/or don't know much about baseball, the Manager and Coaches on the team the players are drafted for will help them learn all the necessary rules for their division. Other players who are more experienced also help the less experienced players find their way, and everyone has a good time! There are different groups of players that are divided into "Divisions". Typically players are placed in divisions based on their age, but prior experience and/or skill can sometimes affect what division they are placed in. Each division has a number of teams that play each other all season. So, if your child's division is T-Ball, and there are four T-Ball teams, then those four teams will play each other throughout the season. T-Ball teams will only play other T-Ball teams, Farm teams will only play other Farm teams, and so on. Here are the different Divisions, described in how they differ from each other. Who is it for? T-ball is for our youngest players, boys and girls baseball age 4-7. This is your child’s first introduction to organized baseball. Managers and coaches provide age appropriate instruction in an encouraging and supportive setting, and receive league support and training to do so. The Player Agent forms T-ball teams. Parents are encouraged to participate at the coach’s request. What Skills are Taught? Managers and coaches begin to teach the rules of the game, including the names of the positions, base running and the notion of ‘outs’. Players learn throwing and catching basics and how to safely swing the bat. All players bat off a batting tee, through the lineup, every inning. How is the Game Played? Games last approximately 3 innings or about one hour and are played one weeknight and/or Weekend Day at either the Green Acres Elementary School Minors Field or the Del Mar Elementary School Baseball Diamond. Directions to the fields are under the Locations tab. A lot of parent support and participation is needed. Defensive teams typically have 2 adults in the outfield and offensive teams need 2 base coaches and one Tee helper to assist or coach the batter. All players play the field every inning. The league does not keep score or standings. Every player bats every inning. Who is it for? Farm is a non-competitive, instructional division, one level above T-ball. The core age for Farm is baseball age 7-8. Players league age 6, with at least one season of T-ball may consider playing Farm. Some players are new to the game, although many have played T-ball. Teams are formed by the Player Agent. What Skills are Taught? Managers and coaches further a players understanding of the rules and positions, and work on improving throwing and catching. Key concepts learned in this Division are how outs are made, how to react when a ball is hit in the air, and following the base coach’s instructions. When playing the catcher position, proper positioning behind the plate is taught. Each team's coach or manager pitches to the batters on their own team using a soft velocity pitch. The flow of the game is introduced, as players understand how outs are made and what makes up an inning. How is the Game Played? Coach pitch is used in this Division and players play designated positions. Score may be kept, but is not recorded. There are no standings and the emphasis remains on building baseball knowledge and strong fundamentals. An inning ends when the defensive team records 3 outs, or a maximum run limit is reached. Everyone sits the bench from time to time but will always hit in the lineup. Coaches will play players in a variety of positions they can play safely. Balls and strikes are not called, but if a hitter swings three times and misses, then the hitter is out. Foul balls will also count as a strike and the standard two-strike foul ball rule applies. A batter is out after five hittable pitches. Games are generally played at Green Acres Elementary School Minors Field. Directions to the field are located under the Locations tab. Players are responsible to bring their own gloves and shoes. Athletic cleats are not mandatory, but highly recommended. Athletic cups are highly recommended for all players and are required for everyone playing catcher. Who is it for? The AA Division is for 8 and 9-year-olds who want to continue to develop their baseball skills. Many players in AA played in the Farm Division as a 7 and/or 8 year old. For spring baseball, player assessments are conducted and a draft selection process forms the teams. It is essential that players attend one of the skills assessments to assist in determining appropriate league placement and allow for competitively balanced teams. What Skills are Taught? The major difference between AA and Farm is that a kid pitches, instead of a coach. However, instead of walking on Ball-4, a coach will “soft-toss” the ball to the batter for an additional opportunity to hit the ball, and each of these pitches will count as a strike whether it is hittable or not, until 3 strikes or a hit has occured. From an instructional standpoint, a main objective of this division is to help players become more comfortable at the plate and improve their ability to hit the ball against live pitching. Key skills developed include being prepared to make a play defensively and situational awareness when fielding, being able to identify the strike zone, and demonstrating proper form when catching and throwing. How is the Game Played? In AA, a player is out after 3 swings and/or strikes. This helps build confidence, encourages the batter to wait for a good pitch before swinging the bat and speeds up the overall pace of the game. Coaches will play the players in a wide variety of positions they can play safely. Everyone sits the bench from time to time. Runners may steal as soon as the pitch passes home plate if they wish, but may not steal or lead off a base otherwise. Games are generally played at Green Acres Elementary School on the Minors Field. Directions to the field can be found under the Locations tab. League standings are not kept and scores are not recorded. A season ending, double elimination tournament is played and gives all teams the opportunity to experience post-season excitement! Players are responsible to bring their own gloves and shoes. Athletic cleats are not mandatory, but highly recommended. Athletic cups are highly recommended for all players and are required for everyone playing catcher. The coaches umpire the games, no third party umpires are present at this level. Who is it for? This division further develops competitive baseball. The core age for the AAA Division 9-10 year old boys and girls who want to continue to develop their baseball skills. 11 year olds may also play in AAA if another year for development is needed before moving up to the Majors Division. Most of the players in AAA played in the AA Division at least one season as an 8 or 9 year old. However, any eligible aged player with appropriate baseball skills is welcome, even if this is his or her first experience with baseball. For spring baseball, player assessments are conducted and a draft selection process forms the teams. What Skills are Taught? The major difference between AAA and AA is that only kids are pitching and runners can steal bases on a passed ball over home plate, there is no “soft toss”, and third party umpires are present to officiate the games. Leading off is allowed between pitches until the pitcher returns to the mound, at which point the runners must attempt a steal or return to their previously attained base. Also, the fielding and hitting will have improved and an increased element of competition is added. From an instructional standpoint however, the main objective in this division is to continue to develop players in the field and at the plate, teach fundamentals and good sportsmanship, win or lose. Pitching becomes a bigger focus. Pitch counts are recorded and closely monitored for the pitcher’s safety. Key concepts learned at this age are more aggressive plays, both offensively and defensively. Players begin making longer throws, hitting the cutoff, and tracking and catching fly balls. Offensively, they are aware of signals from the coach, know to adjust the approach after 2 strikes, and know when to take the extra base. How is the Game Played? Every player is in the batting lineup for every game. On defense, players will learn to play a variety of positions he or she can play safely. While all players bat, only nine players take the field on defense. Coaches will play the kids in all positions they can safely play. Everyone sits the bench from time to time but always hit in the lineup. Games are generally held at Green Acres Elementary School on the Majors Field. Directions to the fields are listed under the Locations tab. League standings are kept to determine a regular season champion and a season ending double elimination tournament is conducted to determine the AAA Division Tournament Champion. This enables all players the opportunity to experience post-season excitement! In addition, there are opportunities to make the 9/10, 10/11, and 11/12 year old All Star Teams that participate in the District 39 All Star Tournament. These teams typically play well into July. Players are responsible to bring their own gloves and shoes. Athletic cleats are not mandatory, but highly recommended. Athletic cups are highly recommended for all players and are required for everyone playing catcher. Who is it for? 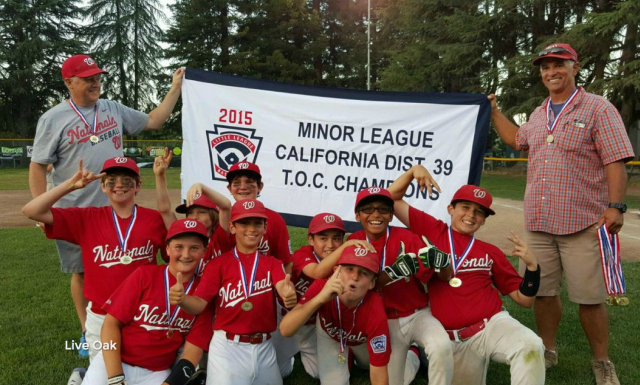 This is the premier Division for Little League. The core age for Majors is 10-12 years old. The age range is wide to accommodate those that have significant baseball instruction and are ready for Majors, as well as players needing additional instruction on baseball’s complexities before playing full baseball. In this Division, there is a greater emphasis on team play, which includes teams working together to win games. By the time a player is eligible for Majors, he or she generally has played a few seasons of baseball and is very familiar with the way the game is played. For spring baseball, player assessments are conducted and a draft selection process forms the teams. What Skills are Taught? Stamina and concentration are important. Longer accurate throws are expected and full attention is required. Players learn to react quickly, throw properly and accurately on the run and make consistent, hard throws to any base or the plate. Pitching is more sophisticated as pitchers develop more arm strength and improved form. How is the Game Played? All players bat in the lineup the whole game. Coaches will play the kids in more than one position, but look for overall balance on the team and develop players accordingly. Everyone sits the bench from time to time but always hit in the lineup. Games are generally held at Green Acres Elementary School at the Majors Field. Directions to the fields are listed under the Locations tab. League standings are kept to determine a regular season champion and a season ending double elimination tournament is conducted to determine the Division Tournament Champion. In addition, there are 10/11 and 11/12 year old All Star Teams that participate in the District 39 All Star Tournament. These teams typically plays well into July. Players are responsible to bring their own gloves and shoes. Athletic cleats are not mandatory, but highly recommended. Athletic cups are highly recommended for all players and are required for everyone playing catcher. External links are provided for reference purposes. Live Oak Little League is not responsible for the content of external Internet sites. Copyright Live Oak Little League All rights Reserved.